A while back we featured Moon Animate Make-Up, a wonderfully creative fan project that saw more than 250 artists contribute to reanimating an episode of Sailor Moon. Inspired by this project, a group of Dragon Ball fans decided to mount a project of their own known as Seven Stars Reanimate. In December of 2015 the project put out the call to artists and animators of all stripes to recreate a short sequence of an episode of the original Dragon Ball episode. Once again more than 250 artists feature, bringing a beautifully varied array of styles. Some are somewhat close to the original, but many are not. The episode chosen was episode 8 of the original series. After the many hours put in by talented creators around the world, the completed episode is now available for your viewing pleasure. Dragon Ball fans may notice that a slightly unfamiliar English dub is used as the basis for the main part, rather than the Funimation one that is available today. 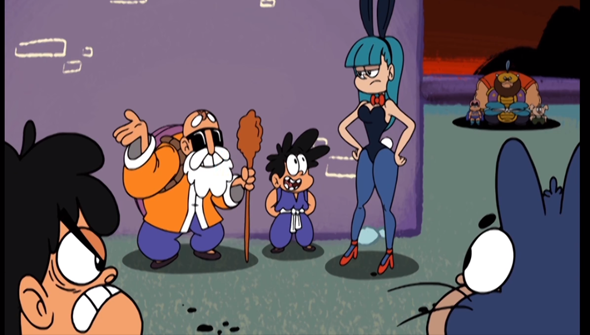 However, bits from the later dub are mixed in, in order to create a version that is true to the original, and its occasionally cheeky humour (mostly thanks to Master Roshi). We just love projects like this that show what a talented and creative bunch the animation fan community is. Its a lot of fun to see so many styles and techniques rubbing shoulders, and paying tribute to the art they love. Check out the episode below and make sure to visit the project's tumblr page for more details on many of the artists involved.